This special issue comprises of 9 selected papers from the International Workshop on Computer Science and Engineering 2009 (WCSE 2009) & International Symposium on Information Science and Engineering 2009(ISISE 2009). The conferences received 1350 paper submissions from 17 countries and regions, of which 512 were selected for presentation after a rigorous review process. 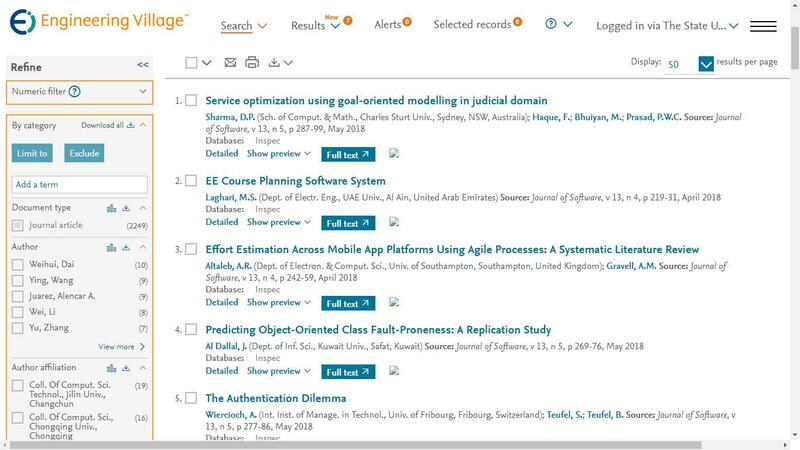 From these 512 research papers, through two rounds of reviewing, the guest editors selected 9 as the best papers on the Software track of the Conference. The candidates of the Special Issue are all the authors, whose papers have been accepted and presented at the WCSE 2009 and ISISE 2009, with the contents not been published elsewhere before. The WCSE 2009 are sponsored by Qingdao University of Science & Technology, China; Peoples’ Friendship University of Russia, Russia; Nanchang HangKong University, China; National Chung Hsing University,Taiwan;Hunan Agricultural University , China; Guangdong University of Business Studies, China;Jiaxing University, China. Technical Co-Sponsors of the conference are IEEE, IEEE Shandong Section, and IEEE Shanghai Section. “Cognition Inspired Object Oriented Knowledge Warehouse Architecture”, by Xixu Fu and Hui Wei. In this paper, the essence of knowledge is analyzed according human cognition and related work first. Then 3-World theory of knowledge warehouse structure is advanced based on the analysis. Based on the theory, the common sense and concept cluster is further discussed and the architecture is advanced. At last the problem solving process on this archietecture is discussed. “An Approximate Optimal Damping Control Method for Nonlinear Time-delay Systems with Disturbances”, by De-xin Gao and Jing-jing Wang. A systematic ODC algorithm is presented in this paper for nonlinear time-delay systems with sinusoidal disturbances. The proposed algorithms not only solve optimal control problems in the nonlinear time-delay system but also reduce the computation time and improve the precision.